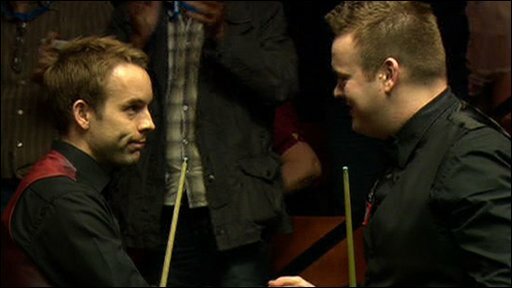 Graeme Dott and Ali Carter came through last-frame thrillers to make it through to the World Championship semi-finals. Dott was involved in a titanic struggle with Mark Allen that swung both ways before the Scot won 13-12. He will face Mark Selby - conqueror of Ronnie O'Sullivan - in the semis, while Carter will face Neil Robertson after beating Shaun Murphy in his decider. Murphy, who led 8-4 and 12-11, looked set to win the final frame but was made to pay after missing a simple pink. Carter and Murphy went into their final session with the match level on 8-8 after breaks of 87, 73 and 64 helped the former claw his way back into the match. He opened the evening session with a 122 to take the lead for the first time at 9-8, but the English pair continued to trade frames. Murphy took the lead at 12-11 but a 59 break by Carter ensured the match would go to a final-frame shoot-out. 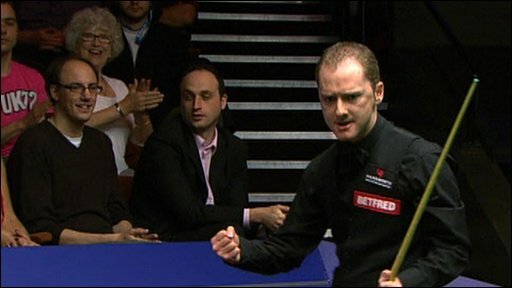 Carter looked to have run out of lives when 2005 champion Murphy rattled off a break of 40 and looked to be in a good position to clear the table only to miss what appeared to be a straight-forward pink. Runner-up two years ago, Carter eventually cleared up the colours to end Murphy's challenge. Earlier Dott, champion in 2006, lost the first four frames and recovered to start Wednesday at 8-8 and moved to 10-8 with breaks of 65 and 54. Allen edged a monumental 20th and made it four in a row to sniff victory. But Dott hit back with a 115 and secured his third successive frame to complete a magnificent comeback. Dott, ranked number 28 in the world, was delighted to have survived his almighty duel with Allen. "It was a great game to be a part of. I always knew it was going to 12-12," he said. "I have won this tournament before and I think this is a massive advantage to me. I know anything can happen here. That was the biggest match of the season for me to get back into the top 16." After a titanic battle in the first two sessions saw Dott and Allen share 16 frames, the champion from four years ago raced out of the blocks on Wednesday morning. Dott, based in Larkhall, looked in flowing form and eased into a 10-8 lead only to see his opponent from Northern Ireland turn on the power and get back on level terms at 10-10. Allen has blossomed in this tournament with comfortable wins over Tom Ford and Mark Davis, as well as a 146 break, and a combination of potting and safety helped him win an enthralling 20th frame. The world number 11 had built up a 20-point lead and after Dott wasted several openings, Allen pounced to sneak it, with the highlight an incredible two-cushion recovery when snookered behind the blue. Dott looked favourite in the next with a 53, but last year's Crucible semi-finalist stole it and went on to pinch his fourth frame in a row to get within one of the finish line. Back came the 32-year-old Dott with a nerveless century to stop the rot and his surge continued to take it to a decider. With the initiative and momentum firmly in the Scot's corner, Dott knocked in a 28 and after Allen spread the balls when snookered, the former champion held his nerve to wrap up a hard-earned win. Allen said he expected to lose after losing grip of the match having led 12-10. "I didn't get a clear cut chance," he said. "From 12-10, Graham played three perfect frames to win. I never felt comfortable in any of the sessions. "I wasn't timing the ball well and just happy the way in which I dig deep to win frames. Graeme will need to play better in the semis but he has got the guts and determination to go all the way."